Spain has more than a third of the world's olive trees, and is the top producer of olive oil in the world. ↑ Grossi, M.; Di Lecce, G.; Gallina Toschi, T.; Riccò, B. (2014). 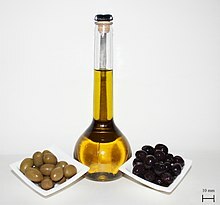 "Fast and accurate determination of olive oil acidity by electrochemical impedance spectroscopy". IEEE Sensors Journal 14 (9): 2947–2954. doi:10.1109/JSEN.2014.2321323. ↑ United Nations Conference on Trade and Development. Most recent figures available. This page was last changed on 26 August 2018, at 05:39.